Classes and homework hardly slow Ravi Kaur down at work. The September Student Worker of the Month is busy this fall, though she takes on her tasks with a smile. Ravi Kaur, September Student Worker of the Month. The Grand Canyon University senior, a health care administration major, serves as a student worker in Curriculum Design and Development at the 27th Avenue office. Kaur assists with a wide range of projects that help her develop skills that could someday help her in her career. “I want to be an administrator for a clinic … in an ambulatory surgical clinic,” said Kaur, who started as a nursing major but realized in clinicals that she preferred the administration side of health care. “I particularly want to work in risk management,” she said. 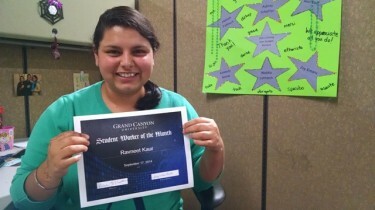 Kaur’s manager, Haydee Serna-Masters, nominated Kaur for the award — which is given out by GCU’s Career Services department, which organizes more than 1,600 student workers across the University. Kaur chose GCU because of her helpful enrollment counselor, the small class sizes, and the one-on-one attention from instructors. She said she enjoys her student worker position because of her friendly manager and coworkers, and appreciates the fact that she is treated as an equal. Contact Career Services at 602-639-6606 or careerservices@gcu.edu or stop by the Career Services office in Camelback Hall.